Upon entering the LeMay America's Car Museum, (ACM) albeit believe I-T was in the lobby before the cashier's desk, there was a black BLOB sittin' silently on display, a retro themed Ford Mustang, which Tacoma Bureau Chief Mary ELLEN pronounced to Mwah was called the Microstang'; Microsoft's pathetic attempt at pumpin' U-P that RECHID operating system winDOUGhs 8, which thankfully was extremely short lived! And there was one of those Clown-like, adorable Isetta's on-hand, even with a decretive wind-up tab on it, as these are just the funkiest 'lil People Movers ever! Which think I was first introduced to them in Der Fatherland appropriately. With this version being of 1957 vintage - whilst I simply wished to get to the Art Cars, Ja-Ja! The first automobile seemingly in this exhibit that Mary Ellen called out to Mwah was an excellante '59 Caddy De Ville, noting it's 100-point Hemming's Motor News status; Huh? As LeMay ACM seemed to have quite a trove 'O automobiles of this desired status. These cars were not 100 point cars but rather cars that were part of Hemming Motor News’ top 100 American cars. We have marked the cars in our collection that are on that list. Another car I've never heard of before was mentioned in the Harold LeMay video montage we stopped 'N listened to, whilst spiraling our way downwards to those lurking Art Cars, noting how he enjoyed trucking round with a Chevrolet Baby Grand inside one of his refuge haulers! As LeMay made his fortunes originally in the garbage business. As apparently this was one of Chevrolet's first automobiles, notably sporting the first Bowtie insignia, in deference of Louis Chevrolet's Swiss roots when debuting at the 1914 New York auto Show, as the Baby Grand was a 4-door Touring Car, part of the 1914-16 H-Series. Although I've since looked him up, and even found an accompanying article 'bout him, still really have ZERO clue who this Dude is, never having heard of him 'til stepping inside the ACM; other than he's apparently a very wealthy collector, notably of BMW's who appreciates Art, specifically moving freight, or rolling stock! As several of his current automobiles are on loan to the museum, including the Art Cars, and the Z4 Patronas racecar we spotted, albeit definitely didn't see everythingy' mentioned. Whenever I hear the term BMW Art Cars, I immediately conjure up unseen images of the late Andy Warhol, who actually was the fourth artist BMW commissioned for its burgeoning Art Car project, ironically also an M1. Yet, having stumbled into the just released 18th Art Car, which is actually the 19th Overall, which will race at the upcoming 2017 Rolex 24 as one of Rahal Letterman Lanigan Racing's BMW M6 Saloons; Cornfuzed? As I'd learned about this upcoming Art Car after having finished this story, Alas this 18th v 19th Art Car is a whole nutter' story topic for another day! As the first of the two Art Cars sitting in tandem was, and perhaps is? The second most valuable? Presumably after Messer Warhol's, eh? Although the very first Art Car may give 'em both a run for their money? 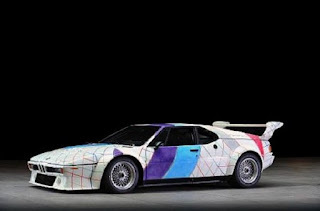 As the ex-Peter Gregg Art Car is intriguing since it actually wasn't a BMW commissioned chassis, but instead a special "One-off" with BMW's permission for the late racer Peter Gregg, whom BMW invited to purchase said M1 Racecar, created by renowned artist Frank Stella honouring the late Ronnie Peterson, presumably Gregg's "Hero." Ironically, Artist Frank Stella was the passenger riding with Peter Gregg when he crashed en route to le Circuit de la Sarthe, in Paris prior to the 1980 24 Heurs du Mans, with Gregg being replaced by some Bloke named Derek Bell aboard one of the factory's 924 Carrera GT's, which finished 13th overall with scheduled co-driver Al Holbert. with portions being painted daily. Lastly, upon our way back topside to "Exit Stage Left!" Err leave the building, we Zoom-Zoomed thru the Route 66 exhibit for which we've partaken before, but we came to a screeching halt! In front of a shiny silver, all aluminum station wagon sporting exposed rivet heads upon it's flanks. With this unnamed Beast sporting V-12 motive power, for which a passing-by ACM Volunteer said the car had just arrived and she "Knew Nothin'" about I-T! Whilst there wasn't any information available for said chassis. This car was a hand built car built by Randy Grubb of Oregon. It is called the Falconer because that is the name of the company that built the engine. (also hand built) Randy's definitely a true craftsman and, in my opinion, an artist. The car runs and drives as good as it looks. Ironically, or is I-T Karmically? Randy Grubb works out of his Grants Pass, OR workshop, and the ensuing Hot Rod magazine article notes the car's actually called the Falconer Dodichi, in homage to its V-12 roots.